Pennsylvanians can still butcher, braise, and broil their pet cats and dogs because a murky mixture of politics has left a critical bill on the table in the state senate. Residents may also continue to use cats, dogs, and other animals as targets for what some erroneously call "sporting events." Although there are no documented cases of cats and dogs being thrown into the air at these shoots, there is a long history in Pennsylvania of pigeon shoots. Pennsylvania is the only state where such shoots occur legally. The remaining shoots are in the southeastern part of the state, in Berks and Bucks counties near Philadelphia. However, this past week, an undercover investigator for SHARK, an animal rights group, documented a pigeon shoot in Oklahoma to provide campaign funds for Sen. James Inhofe (R). About 1,000 pigeons, according to SHARK, were thrown into the air a few yards from the shooters. In Pennsylvania, scared and undernourished birds are placed into cages, and then launched about 30 yards in front of people with 12-gauge shotguns. Most birds, as many as 5,000 at an all-day shoot, are hit standing on their cages, on the ground, or flying erratically just a few feet from the people who pretend to be sportsmen. About 70 percent of all birds are wounded, according to Heidi Prescott, senior vice-president of the Humane Society of the United States (HSUS), who for 25 years has been documenting and leading the effort to pass legislation to end pigeon shoots in Pennsylvania. If the birds are wounded on the killing fields, trapper boys and girls, most in their early teens, some of them younger, grab the birds, wring their necks, stomp on their bodies, or throw them live into barrels to suffocate. Birds that fall outside the shooting club's property are left to die long and horrible deaths. There is no food or commercial value of a pigeon killed at one of the shoots. The Pennsylvania Fish and Game Commission says pigeon shoots are not "fair chase hunting." The International Olympic Committee declared pigeon shoots aren't a sport, and banned it after the 1900 Olympics because of its cruelty to animals. But, the Pennsylvania Senate still hasn't taken HB1750 off the table for discussion. Any senator may request the Senate to suspend the rules to allow a bill come off the table; none have. The House passed the original bill, sponsored by Rep. John Maher (R), 201--0, in November 2013. It was amended in the Senate, with Maher's approval, to ban pigeon shoots under Title 18, which includes animal cruelty statutes. 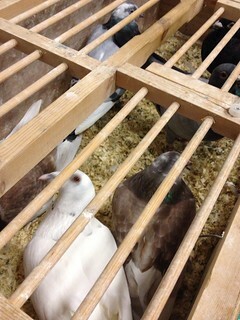 Although butchering and selling cats and dogs would be a first degree misdemeanor, carrying a fine of $1,000--$10,000 and a maximum prison term of five years, pigeon shoot violations would be only a summary offense, carrying a maximum $300 fine and/or three months jail sentence, and only for those operating the shoot. That bill was approved in the Republican-led Judiciary Committee, 10--4, on June 26. In the next two days, it passed two of the required three readings in the full Senate, but was tabled, July 8, when the Senate recessed for more than two months. The bill was not placed on the voting calendar when the Senate reconvened for five days between Sept. 15 and Sept. 24. The Senate is again in recess and will reconvene for two to four days, beginning Oct. 6 before going on recess until after the Nov. 4 election. One of the four who voted against the bill in the judiciary committee was Joseph B. Scarnati III (R), the Senate president pro tempore. In his past two elections, Scranati received $5,275 from the NRA PAC, and $1,000 from the Flyers Victory Fund; the Victory Fund was established to support pigeon shoots. However, Scarnati didn't influence if the bill was to be voted upon by the full Senate, says Kate Eckhart, Scarnati's communications and legislative affairs assistant. The senator who does influence what bills go on the calendar is Dominic Pileggi (R), the majority leader. Pileggi had voted for the bill when it was in Judiciary Committee. However, Pileggi doesn't put a bill on the calendar until the Republican caucus discusses it. Republican caucus leader is Sen. John Gordner (R), who also voted against the bill in committee. However, Gorder says he voted against the bill on procedural grounds. The amendment, says Todd Roup, Gordner's chief of staff, "was slipped onto the committee's calendar at the last minute without required notice." Gregg Warner, the Judiciary Committee's legal counsel, disagrees. "We notify members of the committee what bills will be on the agenda on Thursdays or Fridays the week before [a Tuesday meeting]," says Warner, "and then distribute summaries of the bills a day before." Amendments are often distributed on Mondays before scheduled Tuesday meetings. "Once there is enough support in the caucus," says Roup, the bill will go back to Pileggi. The person responsible for counting votes is Sen. Patrick Browne, Republican minority whip. Because caucus discussions are secret, neither Browne nor Gordner will reveal if the bill was discussed. Gordner, however, will vote for the bill if it gets to the floor for a third reading, says Roup.